Based on both the classic 1978 and renowned 2004 Battlestar Galactica TV series. Flee the Cylon tyranny and bring them home today! This iconic ship appeared in almost every episode of the critically acclaimed 2004 Battlestar Galactica television series. Launched from massive Battlestar ships, the Viper Mark II was instrumental in the first Cylon War. Although it was eventually replaced with a newer model, a squadron of the space superiority fighters remained on board the Battlestar Galactica and was re-activated to defend the Galactica during its four-year journey to Earth. The Raider is the primary attack fighter used by the Cylons. Modern Raiders are cybernetic, living creatures with a complex system of organs, veins and fluids inside the main body. They can be killed but can also be reborn, meaning that experienced Modern Cylon Raider combat ships are quickly available for duty again.Its sleek design means it can speed past nearly all enemy ships and hunt down slower ships as well as dodge bullets in firefights. Coming soon, from the team behind the successful Star Trek: The Official Starships Collection, a new series of oversized die-cast models based on Battlestar Galactica. This new 12-issue series will feature models from both the classic 1978 and the 2004 series, and will be available exclusively through the Eaglemoss shop and selected comic-book retailers across the US, Canada, Europe and Australia. 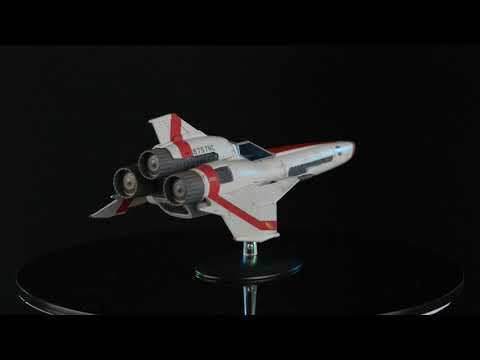 The team have worked closely with members of the modern Galactica VFX team to ensure that the models are as accurate as possible.